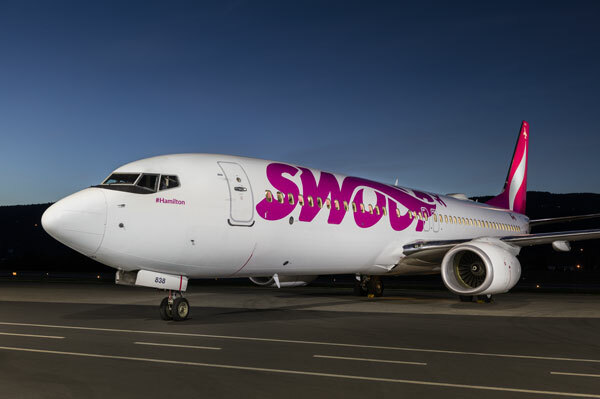 Swoop took delivery of its first Boeing 737-800NG aircraft, marking one of many exciting milestones as the airline prepares for the launch of operations on June 20, 2018. In the coming weeks and months, Canadians can look forward to many exciting milestone announcements, from Swoop’s official uniform unveiling to the launch of a range of international destinations. The unveiling of Swoop’s livery has been much anticipated, prompting Swoop to share a first look teaser image on social media last week. Emblazoned with the eye-catching magenta Swoop logo, and magenta accented tailfin and winglets, this is the first of six Boeing 737-800NG aircraft to be delivered this year. Go to www.FlySwoop.com for more.